The Stan achieved their biggest win of the season on a cold afternoon. There were 2 changes from the team that lost narrowly to high flying Chester le Street 2 weeks previously. McCabe and Burns replaced Ward & Walker respectively. A very young looking Esh kicked off, with the Stan attacking the car park end. 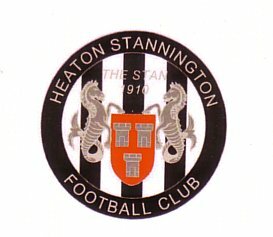 The Stan were immediately on the attack when a deflected cross from Hayton went out for a corner and he headed wide from the resulting corner. With 7 minutes on the clock a great run down the left from Burns forced another corner. It was delivered well but everyone missed it and the ball went harmlessly out for an Esh goal kick. After 10 minutes, Esh launched their first real attack of the game when a mistake by the Stan defence almost let Hogan in but Stan keeper Smith was alert and cleared. A good run by the dangerous Jones produced a corner which caused confusion in the Esh defence and they failed to clear it. This allowed Lewis Burns to rifle a left foot stunner into the top right giving Esh keeper Richardson no chance. The Stan are 1-0 up after 18 minutes and nearly doubled their lead just 3 minutes later when Hayton checked inside the box but the Esh keeper Richardson pulled off a fine save. The Stan Army didn’t have to wait long however for the Stan to double their lead. The Esh keeper was challenged by Hayton and the ball spilled loose allowing central defender Peter Scott to fire an unstoppable shot which gave the keeper no chance. It was a goal any striker would have been proud of. The Esh players were very unhappy with the referee as they thought it was a foul by Hayton on the keeper but he waved their protests away. After 31 minutes, another shot from Hayton was blocked by the Esh defence resulting in another corner. The Stan were well on top and dominating. After 41 minutes Esh finally mounted an attack forcing 2 corners but these were well dealt with by the Stan rear guard. After 42 minutes, great work by Jones saw him set up Gary Yates and he made no mistake putting the Stan 3-0 up at half time. There was a quiet start to the 2nd half and it took until the 50th minute and a good ball from Jones to Yates who in turn found Bailey who shot just wide. In 51 minutes, a great free kick from Jones resulted in Ryan Bailey heading home unchallenged to give the Stan a 4-0 lead. In the 53rd minute, Telford replaced Jones and 7 minutes later Fulcher replaced the excellent Lewis Burns, with Esh glad to see the back of him. The goals did not stop however and a lovely ball by Yates put Dean Imray in and he made it 5, after 63 minutes. The Stan made their 3rd and final change when Rowntree came on for Hayton. Esh were still battling and had a chance of a consolation as Hogan was clean through but dragged his shot wide, not troubling Smith in goal. It is goal number 6 after 82 minutes as McCabe fed Telford who crossed and there was club legend Gary Yates to head home. It also should be mentioned that Gary Dixon was having a great game. Esh were well and truly beaten and the referee put them out of their misery as the Stan recorded their 10th home league win and one that does the goal difference a world of good. Stan Team: Smith; McCabe; Dixon ; Stoddart; Scott; Imray; Jones (Telford); Bailey; Yates; Hayton (Rowntree); Burns (Fulcher). Unused sub: Wear. No cards issued.